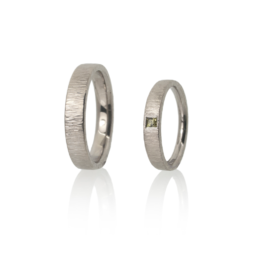 Handmade wedding bands in certified 18k white Fairtrade Gold. These wedding bands were hand-alloyed from scratch and finished off with a contemporary linear hammered texture. The bride’s ring was gently tapered in two ways and set with an ethically sourced green sapphire from Australia. The groom’s ring was an inverted D style, with a flat surface on the top and a gentle curve inside. 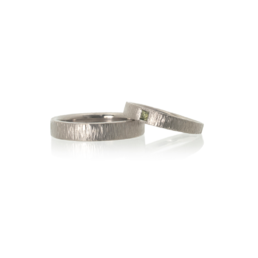 These rings can be handmade to a variety of profiles and finishes and in Platinum, Palladium and Fairtrade Gold.